Here's a little peek at a piece of beadweaving that I just finished. 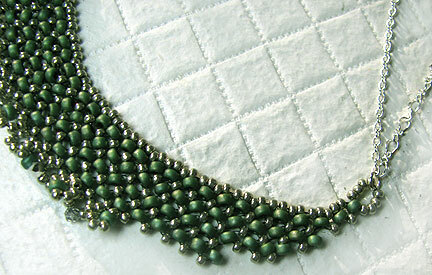 You can probably tell that it's right angle weave beadwork (RAW) and that it's a necklace. It's not my design, and there's a reason that I'm not showing you the whole thing...you might want to make one yourself! I told you all about Facet Jewelry Box earlier this year. It's a great subscription to have if you don't have a local bead shop, or if you just want additional projects to do each month. The nicest part is that everything you need, with the exception of the tools, is included. No more buying an entire hank of beads just so you can use a couple of them in a project! The tools needed are all basic, so if you've been making jewelry for any length of time, you'll have all you need. This box came with a necklace and earrings set. So far, I have finished the necklace...the earrings I've set aside for later this week when I'm in between other projects. I mentioned back in the Spring that I love how all the materials come packed together in zip-locs that have the project name right on them. I also really like that there are a few extra beads in case they are not all perfect. The instructions are easy to follow, and there is additional help online if you need it. The instructions also include tips as to why the project works, which is helpful if you decide you want to make another using different materials. The only thing that I didn't like was that Fireline was sent for the beadweaving. I hate the stuff, though I know it's all personal preference. I used my Nymo thread instead and it worked fine. Perhaps I should have taken the opportunity to really work on using Fireline, but...yeah, no :-) I don't really feel that it's fair to consider this a true criticism, because so many people really love Fireline, and it probably helps to keep the RAW stitching a bit more rigid. For any readers who are interested in starting a subscription to Facet Jewelry Box, if you use the code HALFOFF at checkout, you can get 50% off your first box!! As regards FTC disclosure guidelines: I have received the above materials free of charge from Facet Jewelry Box in order to write a review. I have not been paid for my endorsement as it pertains to the products received.